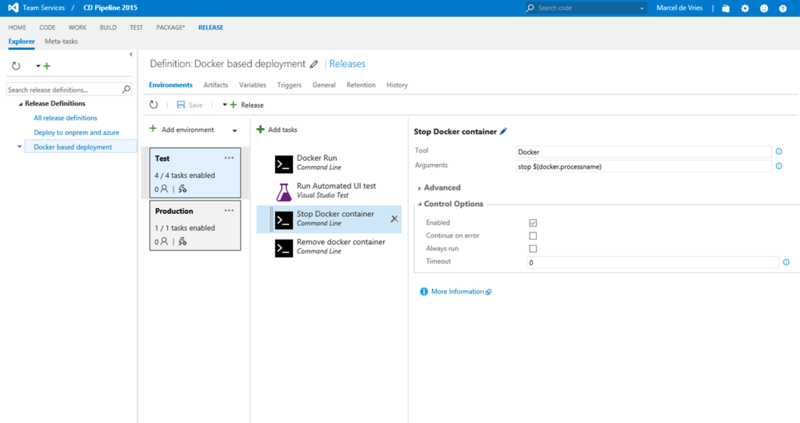 Let us first start by creating a docker image as the result of our build, that we then later can use in the deployment pipeline to very easily run the website from the container and run some UI tests on them. When we want to use docker as part of our build, then we need the build agent to run on a host that has the docker capabilities build in. 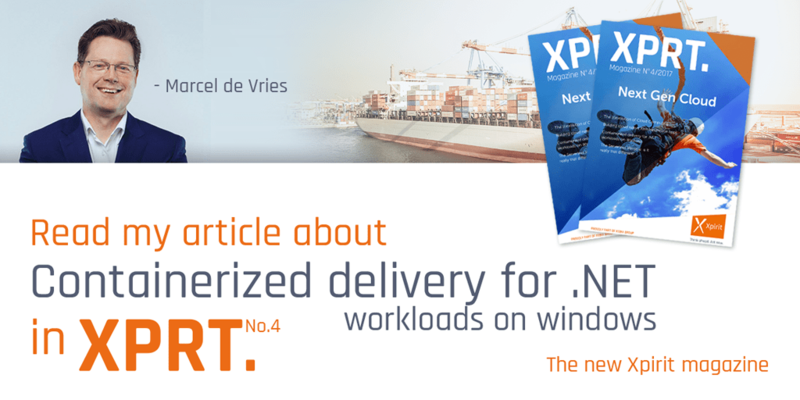 For this we can use either windows 10 anniversary edition, or we can use windows server 2016 Technical preview 5. In my example I choose windows server 2016 TP5, since it is available from the azure gallery and gives a very simple setup. 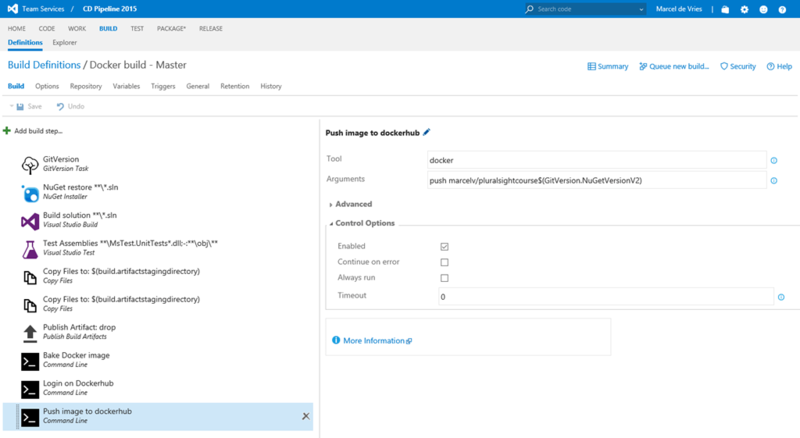 You choose the Windows server 2016 TP5 with containers as the base server and after you provision this in azure you download the build agent from VSTS and install it on the local server. After the agent is running, we can now create a build that contains several commands to create the container image. First we need to ensure the build produces the required webdeploy package and accompanying artefacts and we place those in the artifact staging area. This is simply done by adding the following msbuild arguments to the build solution task that is part of a standard Visual Studio build template. 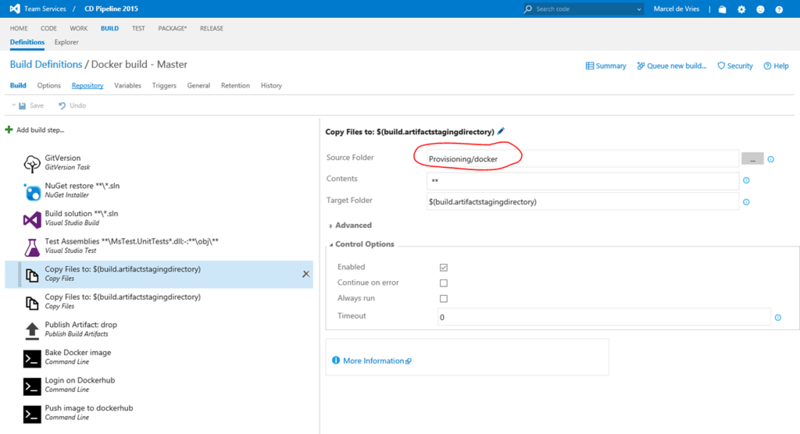 Then after we are done creating the package and copying the files to the artifacts staging location, we then add an additional copy task that copies the docker files I described in my previous post to the artifacts staging directory, so they become part of the output of my build. I put the docker files in my Git repo, so they are part of every build and versioned. After copying the docker files, we then add a couple of command line tasks that we will look at in more detail. In the following screenshot you can see the additional build steps I used to make this work. The first extra command I added is the docker build command to build the image based on the dockerfile I described in my previous post. I just added the dockerfile to the Git repository as you normally do with all the infrastructure scripts you might have. The docker file contains the correct naming of the package that we produce in the build solution task. You see me passing in the arguments like I did in the previous post, to give the image a tag that I can use later in my release pipeline to run the image. After I have logged in to dockerhub, I can now push the newly created image to the repository. Now I go to release management and create a new release definition. What I need to do to run the docker container, is I need the release agent to run on the docker capable machine, exactly the same as with the build. Next we can then issue commands on that machine to run the image and it will pull it from dockerhub when not found on the local machine. Here you can see the release pipeline with two environments, test and production. As you can see the first step is nothing more then issuing the docker run command and mapping the port 80 of the container to 80 on the machine. 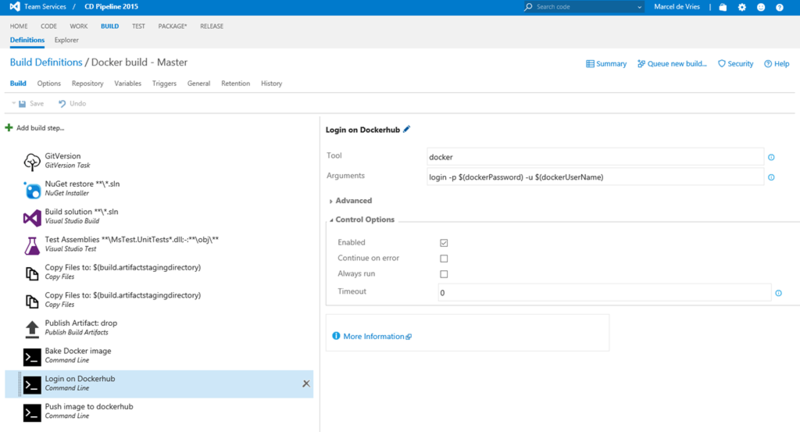 We Also use the –detach option, since we don’t want the agent to be blocked on running the container, so this starts the container and releases control back to the release agent. I also pass it in a name, so I can use the same name in a later stage to stop the image and remove it. the variable $(docker.processname) is just a variable I defined for this release template and just contains an arbitrary name that I can then use cross multiple steps. I used the –f flag, and I set the task to always run, so I am guaranteed this image is removed and even after a non successful release. this ensures the repeatability of the process which is of course very important. As you can see it is quite easy to build containers during the build and use them in the release pipeline. I now used simple command line tasks to do the job, I assume it is just a matter of time before we will see some docker specific tasks in the marketplace for us to use. 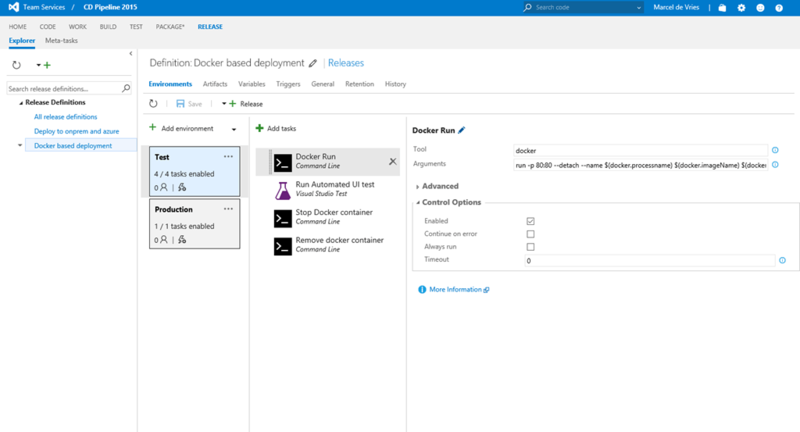 Microsoft has docker tasks in the marketplace, but these are only targeting Linux (at the moment I am writing this) and require a Linux docker machine connection to work. 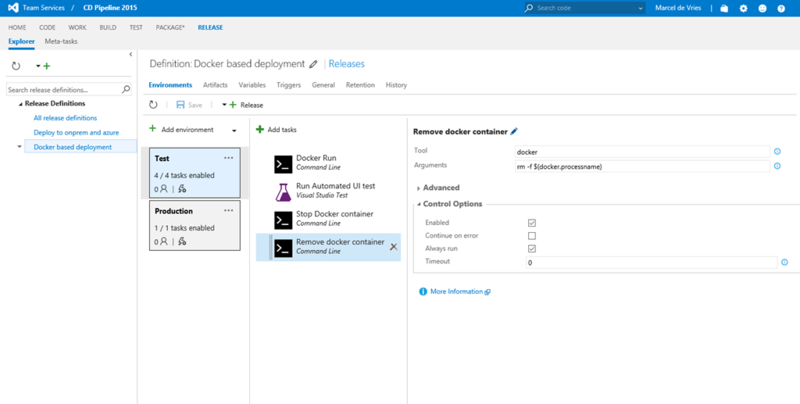 In my example here I am focused on leveraging docker on Windows and for this I hope we can see tasks in the future. How did you tie in result of your build (specifically image name and tag) and provided it to release via variable?